G2000 recently launched their winter collection at their ION Orchard store, a boisterous event with beauty partners such as Blow+bar and KOSE to up the ante. A 20% discount off the final bill was extended to all attendees; and if its not really your thing, choose between a express hair blow-job by Blow+bar or a quick makeover session by the friendly KOSE team. Blow+bar is the first lifestyle grooming bar that specializes in hair blowouts and manicures, offering a luxe pampering experience whilst sipping good wine. Its a one-stop destination for ladies looking for a quick pick-me up during a hectic day or getting prepped for that special occasion. KOSE showcases their darling new limited holiday edition; the “Candy sweet” makeup. Formulated for coordinated eyes, cheeks, and lips, providing a “candy sweet” look of sharp, defined and piercing eyes, contrasted with soft, gentle cheeks. It is currently available in all KOSE stores and counters. I love G2000 for many reasons: its high-quality makes, the flattering cuts and pieces that are both on trend but oh so versatile to wear in many different variations. 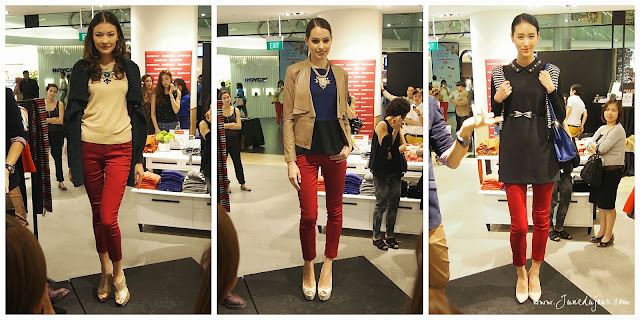 This collection's looks were casual chic, yet with sophisticated cosmopolitan pieces. I especially loved the throw shrug (I have a terrible addiction to anything knitted) paired with a flirty sundress. One of the highlights was celebrity stylish Keith Png who graced the event. He talks about the 3 must-have staples for the season...namely 1) a pop orange peplum hemmed skirt, 2) a collared baroque-print dress (though personally I never took to this pattern cos I felt it looked old-ish) and 3) a red pair of fitted trousers. Besides wearing your outfits the conventional way, Keith also showed how its possible to change the look and silhouette by being creative with how you wear it (eg; wearing a button up cardigan backwards) or adding simple accessories such as a belt. Simple, but quite ingenious. Keith also worked his magic on 2 lucky guests, lo and behold the change in looks! Guy on left is a geeky-looking clean cut style, while the Korean guy on the right rocks a pop-color look. What a difference ; a total image revamp with Guy A in a sharp tuxedo and the Guy B in bomber jacket and casual slacks. AFTER! What do you think? Always happy to bump and catch up with my old friends and ex-colleagues! Nigel and Michelle who were former G2000's trademark fashionable stylist duo, and the some colleagues from the NUYOU and Female. Thank you G2000 for having us!